One way golfers can keep the fairways in good shape is by driving their golf carts properly. Park on the cart path as much as possible. If your ball is close to the cart path, then park the cart on the cart path and walk to your ball. Don’t drive the cart down the fairway, drive over to the cart path and once you have reached where your golf ball landed, drive the cart perpendicular to the fairway, or at a 90-degree angle. This prevents the cart wheels from crushing the fairway grass. Certainly you have seen places on the golf course that have been worn down by golfers continually driving the same route. Keep the golf carts away from the greens, bunkers and traps. A lot of golf courses have a distance rule, such as you must park the golf cart at least 50 feet away from the green, bunkers, hazards or traps. This prevents the grass surrounding these areas from being press down and eventually dying. Another way of keeping the course in good shape is by replacing your divots. Once you have hit your ball, the club digs into the ground and slices out part of the fairway grass. Walk over to where your divot landed and replace it. Put it back in the divot hole, with the grass side facing up, then press lightly on top of the divot to secure it in place. 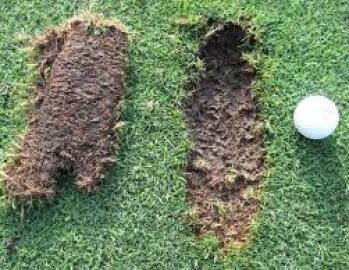 However, if you cannot find the divot, or the grass scatters and no divot is left, fill the divot hole up with sand. Most golf courses attach a small bottle to the either side of the golf cart. These courses even have sand boxes strategically located around the golf course so you can fill the sand bottles back up when you run out. Dump enough sand in the divot hole to level it off and make it flush with the fairway grass. When taking a practice swing to loosen up, don’t cut into the ground like you would when making your typical shot. This will prevent unnecessary divots from being made on the course. If you do take a divot when practicing your swing, make sure you replace the divot or fill the spot up with sand. When on the green, always fix your ball mark. Once the ball hits the green, it makes an indentation in the green where it first landed. You should always carry a ball mark repair tool in your pocket to fix these indentations. A lot of golf courses have this tool available in their pro shop and sell them for just a couple of dollars. Fixing the indentation will allow the green to repair itself and prevent pot-holes from developing on the green. Any time you have to hit from a sand bunker, make sure you rake the sand smooth after you have hit your shot. Every good golf course has rakes that rest close to or right beside each sand bunker. Just grab the rake and smooth out the surface as you back out. It is frustrating to find out your golf ball has landed in a sand bunker that has not been raked by the last golfer shooting from there. Performing these small and quick maintenance procedures while you play golf will keep the course in good shape for you and the players behind you.